This vista from NASA's Mars Exploration Rover Opportunity shows "Wdowiak Ridge," from left foreground to center, as part of a northward look with the rover's tracks visible at right. Opportunity's panoramic camera (Pancam) recorded the component images for this mosaic on Sept. 17, 2014, during the 3,786th Martian day, or sol, of Opportunity's work on Mars. The ridge stands prominently on the western rim of Endeavour crater, about 200 yards or meters west of the rim's main crest line. Its informal name is a tribute to Opportunity science team member Thomas J. Wdowiak (1939-2013). This panorama spans about 70 compass degrees from north-northwest on the left to east-northeast on the right. Wdowiak Ridge rises steeply about 40 feet from base to top. It extends about 500 feet (150 meters) in length. For scale, the distance between Opportunity's parallel wheel tracks is about 3.3 feet (1 meter). This version of the image is presented in false color, which enhances visibility of the wheel tracks. It combines exposures taken through three of the Pancam's color filters, centered on wavelengths of 753 nanometers (near-infrared), 535 nanometers (green) and 432 nanometers (violet). 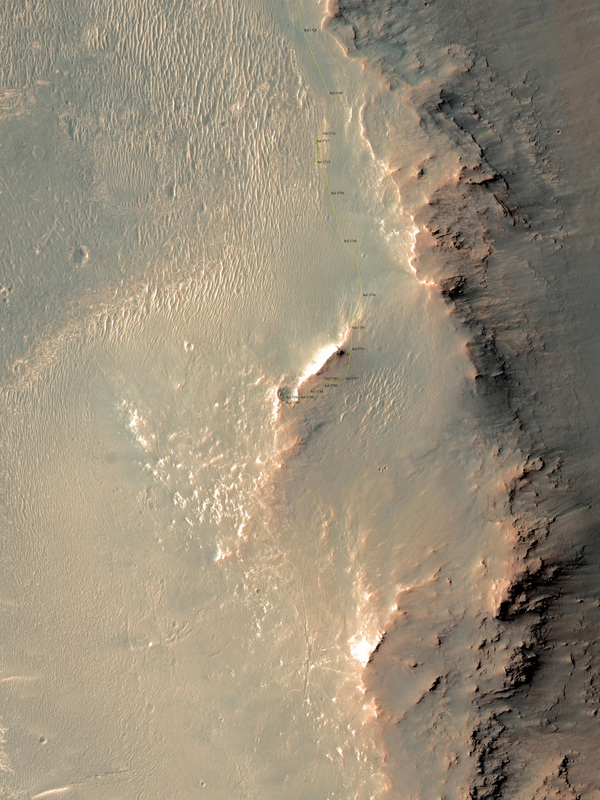 Wdowiak Ridge is visible from overhead in the map at http://mars.nasa.gov/mer/mission/tm-opportunity/images/MERB_Sol3798_1.jpg, from the northeastern end near the rover's Sol 3751 location to Odyssey Crater near the rover's Sol 3789 location.